Step Over & Rapid Walkways There are 10 products. Big Foot Step Overs available with 2, 3 and 4 steps and a 1m landing section. 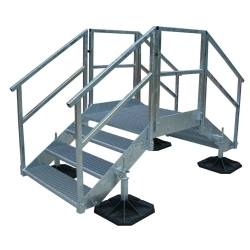 The four legs on each Step Over are supplied with 305mm feet and rubber mats for stability. 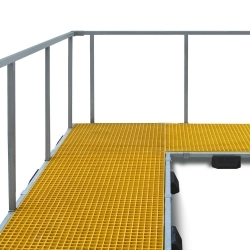 For safe passage over small hazards our Big Foot Step Over Platform is available. 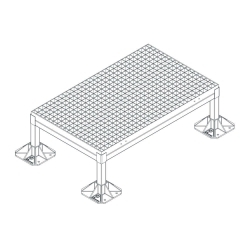 Big Foot Rapid Walkway is ideal for establishing clear, safe non-penetrative pathways around installations on a flat roof. 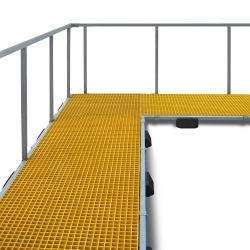 The gritted GRP top to the walkway grating provides a permanent non-slip surface in any weather and is supported on Fix-it Foot feet.